To raise it, pull upwards. To lower it, press on the control A to unlock it, and simultaneously on the head restraint itself. 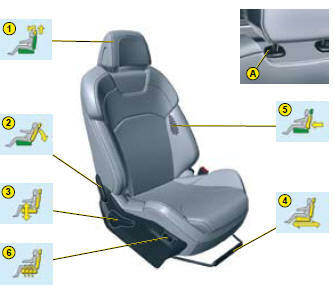 The adjustment is correct when the top edge of the head restraint is at the same height as the top of the head. It is also tiltadjustable. Use the control to adjust the backrest angle. It is possible to recline the backrest angle to 45° by pushing it until it locks. Lift the control bar and adjust to the desired position. Turn the control and adjust to the desired position. Note: The heated seats only operate when the engine is running. For your safety, do not drive with the head restraints removed; these must be in place and correctly adjusted.